Fog on your motorcycle helmet visor is not only annoying but can be a serious safety risk. A foggy helmet visor stops riders from seeing clearly, and slows down reaction time. Luckily, there are many anti-fog solutions, and they come in four main varieties. Depending on their formulas, anti-fog solutions offer either a temporary or permanent fix. In this Ultimate Guide to Stopping Helmet Visor Fogging, we’re going to explore the four different types of anti-fog solutions. This is a permanent anti-fog solution for helmet visors. It shares a range of properties as the Pinlock visor insert, except that they don’t need a proprietary pin system at all. 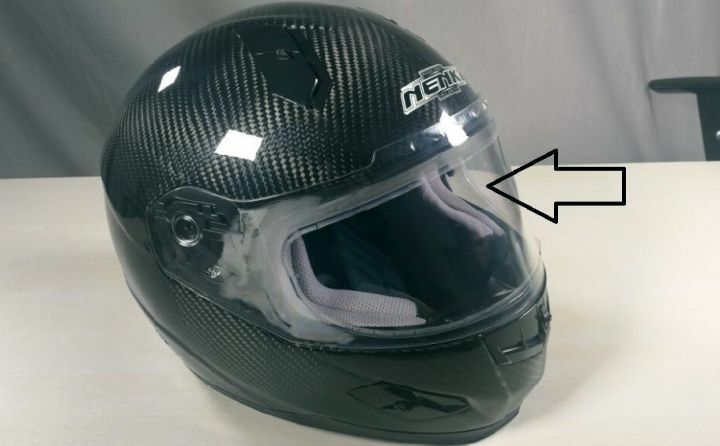 The main advantage about this is that the WeePro visor insert can fit nearly all motorcycle helmet visors, regardless of manufacturer or whether or not your visor uses a pin system. You can find all details here in the video. When we compare it to the Pinlock anti-fog visor insert, it is cost effective and easy to install. Because of it’s ease of installation, low cost, universal application, and long lifespan, it’s arguably the best anti-fog solution. 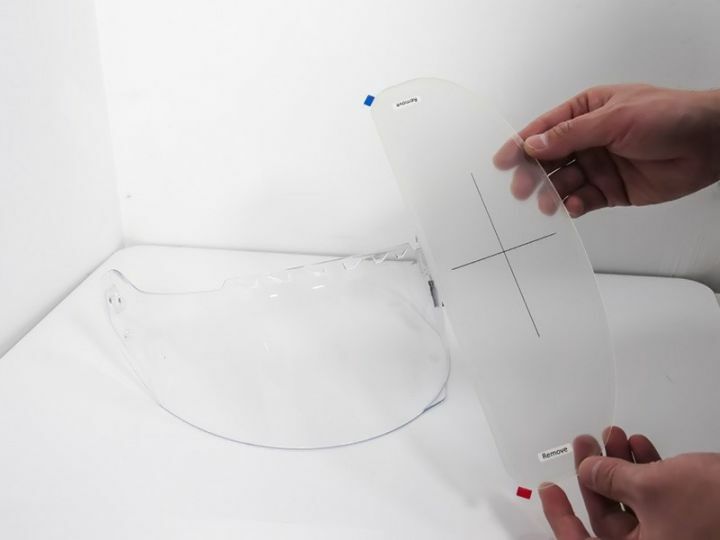 WeePro is a thin, flexible plastic that you can fit on a motorcycle helmet visor. It is similar to the Pinlock except that they do not have sections for inserting the pin at the ends. This means you don’t need to have a pinlock compatible helmet to reap the benefits. 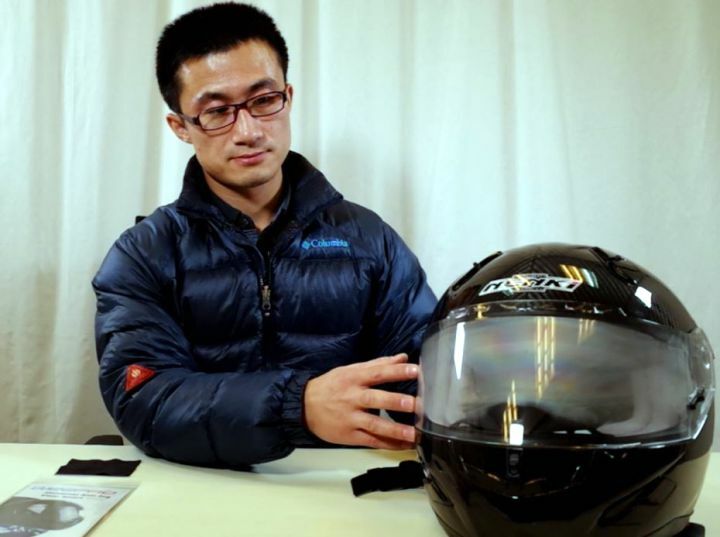 The design of WeePro anti-fog visor insert is such that it perfectly fits on the motorcycle helmet visor. It is a made from a thin anti-fog film, which is a soft plastic with permanent anti-fog ingredients. The film maintains its anti-fog property in extreme weather conditions (cold and hot weather conditions). Furthermore, it has high tensile and elongation strength with superior UV resistant properties. The film is also scratch resistant, and thus can withstand being washed several times. 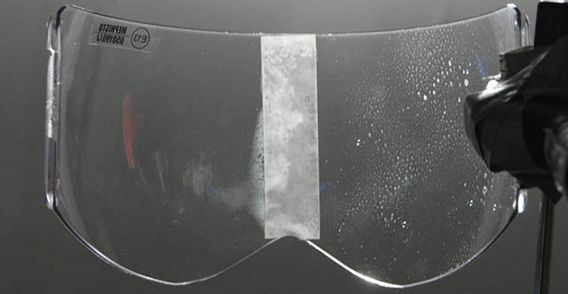 The WeePro anti-fog visor insert has a circled back adhesive which bonds on the helmet visor. 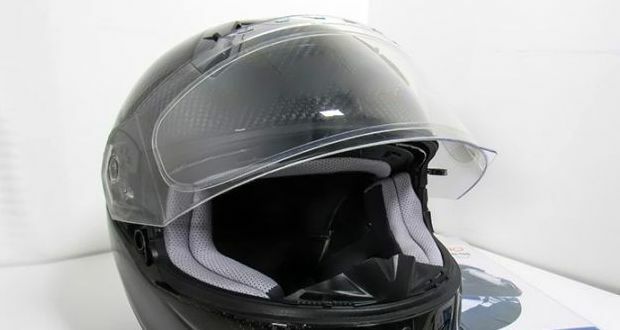 After the installation process, your motorcycle visor will have two layers, with an airtight space between the helmet visor and WeePro visor insert. Clean both your hands and the working table. 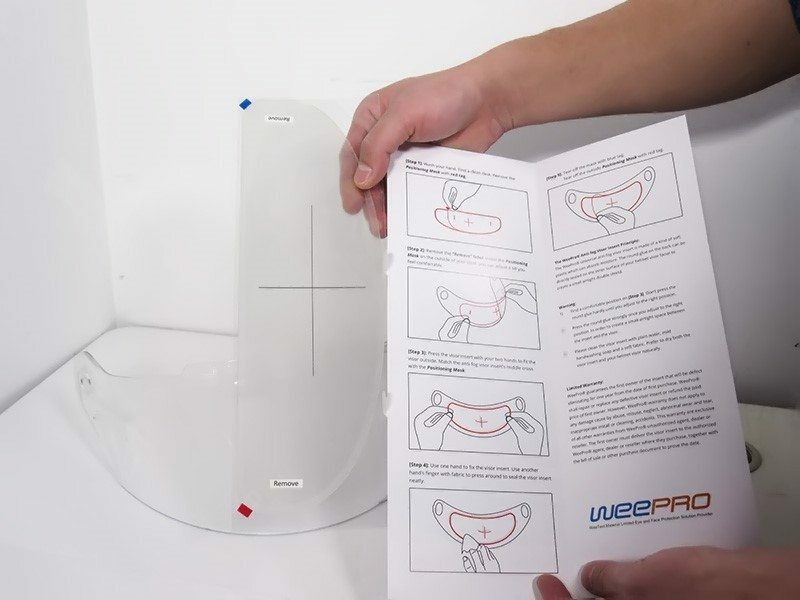 Carefully open the packaging of WeePro anti-fog visor insert where you will find instructions, a piece of soft fabric and visor insert. Be sure to read the instructions included (pictured above). Use the soft fabric to clean the motorcycle helmet visor. Now install the positioning mask (with the red tag) on the outer surface of the helmet visor. You can adjust the positioning mask until the cross is in the middle of the helmet visor. While pressing the anti-fog visor insert with your two hands, its middle cross should match that of the positioning mask. As one hand fixes the insert, use the soft fabric to press the visor insert. Carefully press around the insert to ensure a proper sealing. You can now remove the mask with the blue tag and the positioning mask. Done! The process may seem a bit longer compared to using either an anti-fog spray or installing Pinlock visors, but it’s worth it. You’ll have a permanent, universal and cost effective anti-fog solution. 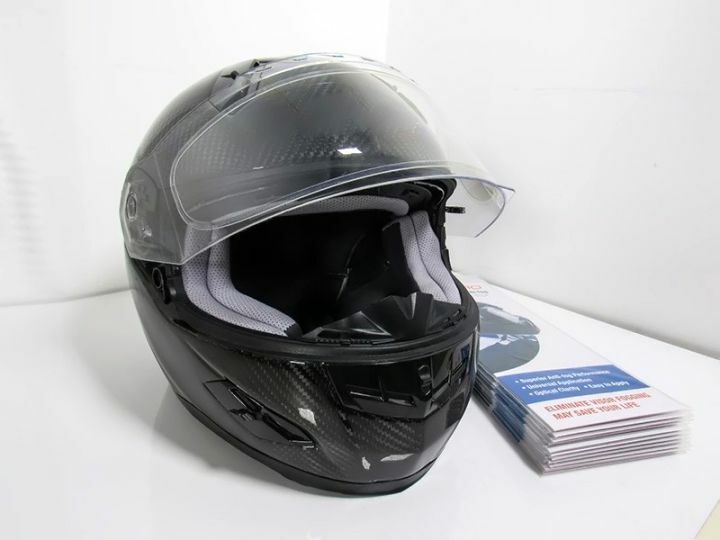 The airtight insulator between the insert and helmet visor form an effective anti-fog barrier. Thus, it helps maintain a stable temperature, hindering fluctuations responsible for condensation. The anti-fog visor insert is a hydrophilic substrate that lowers surface tension of water. It thus forces water droplets to spread into a thin film, allowing for maximum light transmission. The WeePro combines both anti-fog coating and pinlock-like technologies to provide a more permanent anti-fogging solution for all visors. Let’s get straight to the point: Anti-fog spray offers a temporary solution to the fogging problem on helmet visors. Once you apply the anti-fog spray on the helmet visor, you will need to re-apply it again after 24 to 72 hours. Basically, you will have to treat the helmet visor every time before use. For those in climates more likely to be affected with foggy visors, or riders who aren’t afraid of playing in the rain, an anti-fog spray is not only an inconvenience, but also a waste of time. What are the Main Ingredients of Anti-fog Spray? Quite a number of anti-fog sprays are made of active ingredients that form a temporary bond with the helmet visor. They then form a thin, invisible layer of an anti-fog substrate. Normally, the anti-fog sprays exist in the form of hydrophilic ingredients or surfactants. In both cases, they lower the surface tension of water molecules. This results in a very thin film of water instead of small water droplets. The thin film of water allows maximum amount of light to pass through. That means riders can see better. Zooke Anti-fog Spray, just to mention a few. So, if you’re looking for a temporary fog-free helmet visor, you can buy any of these anti-fog sprays. Clean both surfaces of the helmet visor. In most cases the anti-fog spray will come with a suitable cleaning material. Press the spray gun to release the anti-fog solution. Normally, the spray gun will atomize the anti-fog solution into very small equal particles. Spray the entire surface of the helmet visors evenly. The small particles will stick on the surface of the helmet visor, then allow it to dry. By the end of this process, you will have a thin film of anti-fog ingredients on the surface of the helmet visor. This temporary coating will ensure your helmet visor remains fog free, if only for a few days. After that, if you want to use the helmet visor, you will need to repeat the process. If you want a simple, albeit very temporary solution, an anti-fog spray can be a perfect choice. People who only ride in wet conditions on rare occasions might find this solution acceptable. If the spray is the right choice for you, you should still insist on buying a high quality anti-fog spray with natural ingredients. It should also be compatible with your helmet visor materials. On the other hand, if riding a motorcycle is a hobby, passion, or lifestyle, then you should consider the next anti-fog solution. Does anti-fog coating guarantee a perfect solution to visor fogging? Well, yes, but, it is important to note that this is not a permanent anti-fog coating. In most cases, anti-fog coating from the manufacturer does not last for more than 1 to 2 years. Frankly, this is still a better solution than the anti-fog sprays where you have to reapply after 24 to 72 hours. The most popular product is the hydrophilic anti-fog coating. It is Professor Gaétan Laroche from the Université Laval who pioneered the use of hydrophilic ingredients to guarantee a permanent anti-fog solution. During their research, they used the polyvinyl alcohol, which is a hydrophilic compound. Since then, hydrophilic ingredients are a perfect choice for motorcycle visor manufacturers who want a “permanent” anti-fog solution. This is an eco-friendly anti-fog solution that depends on molecular interaction to eliminate fogging on the motorcycle helmet visors. Once a helmet visor has a hydrophilic coating, it will reduce the surface tension of water droplets. By doing so, it forces water droplets to spread into a thin clear and transparent film. Two surfaces: one coated with hydrophilic ingredients and the other without. It is basically a continuous thin film that allows maximum light transmission. Furthermore, it eliminates other phenomena such as diffraction or refraction of light that may reduce visibility. Remember, the irregular shapes of water droplets (fog) are responsible for the loss of light transmission and distortion hence, blurred vision. 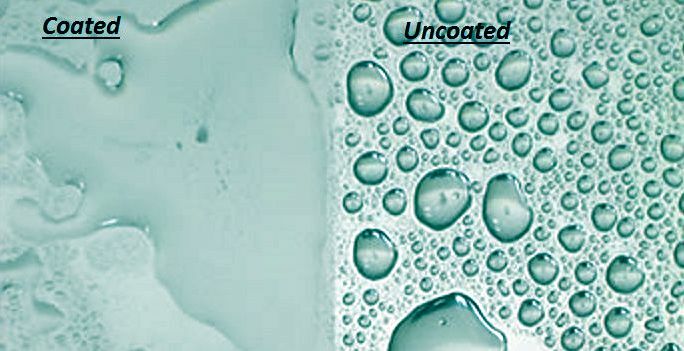 The working principle of hydrophilic anti-fog coating depends on the ingredients’ high affinity for water molecules. That is, they attract water molecules, thereby reducing the surface tension force. In most cases, the helmet visor manufacturer may use different grades or quality of hydrophilic ingredients depending on the geographical location. Remember, it is the variation in temperature and humidity that causes fogging. The good thing about hydrophilic anti-fog coating is that it can withstand being washed several times within 1 to 2 years. It saves motorcyclists the repetitive process of applying anti-fog spray every time. Unlike the anti-fog spray, the manufacturer applies the coating for you. They closely monitor and apply the right layer of hydrophilic ingredients on the inside section of the helmet visor. Quite a number of manufacturers use either flow coating or dip coating. Of course, there are those that use spraying technique. Again, they can use UV curing or thermo curing. This is to ensure an even and high quality drying of the hydrophilic anti-fog coating. Moreover, during this process, the manufacturer may also incorporate other helmet visor technologies. All these aim to guarantee optical class 1 properties. In short, the difference between anti-fog spray and anti-fog coating is that the latter is more durable. Pinlock technology is quite unique and different from the sprays and coatings. It’s also a popular permanent anti-fog solution. The term Pinlock refers to a flexible and small plastic that you will place on the inner surface of the main helmet visor. It should have Pinlock features, i.e. sections that will fit on the helmet visor pins. See pic below. Can you see the curved in sections at the two opposite ends of the visor inserts? Now you can look at your helmet visor too (see image below). The part with the red circle is actually the Pinlock pin system. 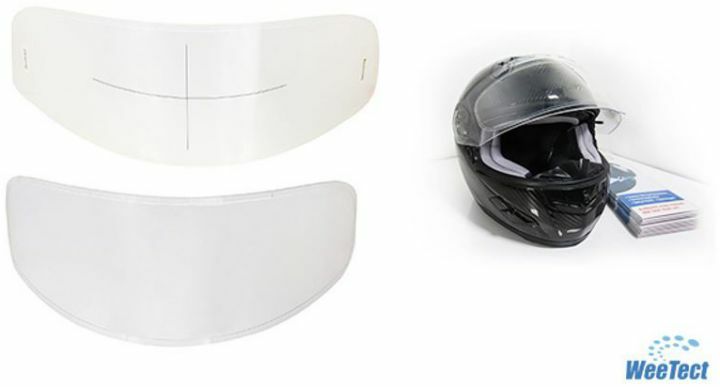 In short, you can install any of the above visor inserts on the helmet visor (below). The final surface will prevent any possible fogging. Since Derek Arnold began developing a Pinlock system in 1978 there have been consistent improvements and innovations in the industry. Ideally, the Pinlock visor insert is a small piece of material with moisture absorbing properties. Around its edges, there is a silicone gasket that forms an airtight seal after installation. Another critical component of this accessory is the Pinlock pin system for easy and fast installation. 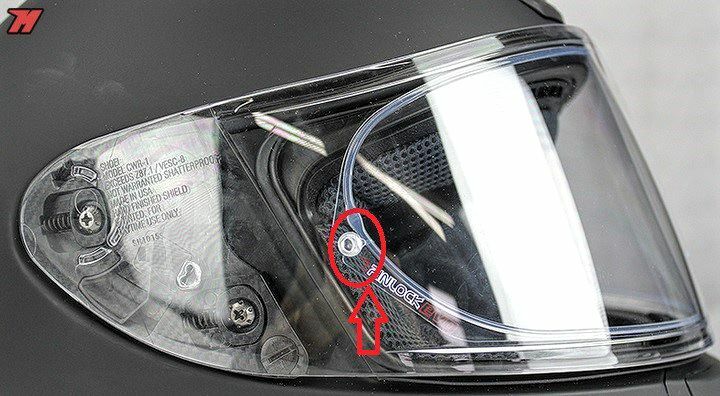 It also allows riders to adjust the tension of the visor inserts. In short, these are the main components that make up a Pinlock system for helmet visors. Now, let’s see how it eliminates fog. Once you install the Pinlock anti-fog visor insert to fit correctly in these pins, the silicon will seal sections around it. After installation, the helmet visor and insert will trap air that acts as an insulator. The double wall system will create an effective anti-fog barrier. These results in effective anti-fog surface due to the efficient absorption properties of the visor insert and double glazed surface. Remember, the pin system not only holds the visor insert in position, but helps to push it in the right position. 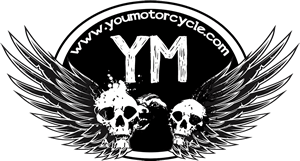 Only a few visors come with the pin system, hence a challenge to many motorcycle riders. They only fit specific models. Now it’s your turn, which anti-fog solution do you think guarantees value for your money? A drop of liquid dish washing soap works well in a pinch. Also for good rain sheeting action the waterproof spray made for leather boots works well. Neither is a permanent fix but works well. When I lived in Japan (a motorcyclists heaven) I had access to a multitude of products of the aforementioned type. Once back in the US I found there was no such items. I noticed incidentally when I was spraying my work boots with this waterproofing spray that it smelled the same as the rain sheeting spray I had used in Japan. I tried it on my visor and found that it worked like a champ. I believe the spray may be called “Camp Dry” if I’m not mistaken.